The new RIGID TQ Case for the SOFTT-W Tourniquet is currently being fielded by thousands of professionals around the world. All of the great features of the original Kydex version but better. Injection molding allows a stronger case that offers a lot more mounting options and adjustments in the ride on your belt or MOLLE compatible vest. The SOFTT-W Tourniquet is held in place by friction, so there are no straps, buckles, or flaps to deal with when seconds matter. The RIGID TQ Case offers true one-handed gross motor skills deployment of the tourniquet. 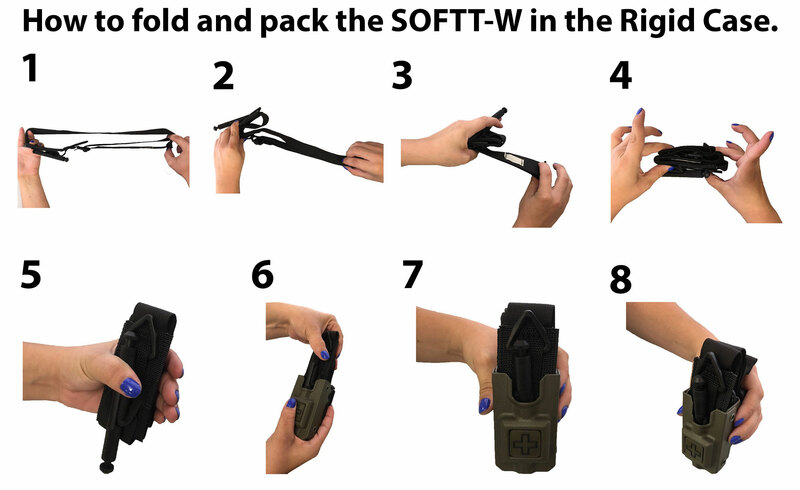 Whether you are running it on your duty belt or your vest, just grab the exposed part of the SOFTT-W and swiftly pull up. The RIGID TQ Case comes with a Blade-Tech, Tek-Lok belt attachment system (fits on belts up to 2.25” wide, including most brands of police duty belts). For MOLLE attachment, the Tek-Lok holder can be removed and a Tactical Tailor Malice Clip can easily be attached or you can order the TQ holder in a specific MOLLE version (call for ordering the MOLLE version). Available for Duty Belt (Blade-Tech, Tek-Lok Belt Attachment fits up to a 2.25" belt), Molle Attachment with (Tactical Tailor Malice Clip). Call for additional mounting options. The TekLok keeps this case from sliding around my belt. The case is bulky, but rigid and the TQ is a tight fit. Keeps it secure, though. Very well built. A little bulky, but it holds the TQ well and does the job. Since I didn't really have 'anything nice to say' in my earlier post I thought I'd provide an update. After quite a bit of experimenting I actually did find a place on my belt where this holder functions and isn't uncomfortable in the process. I did have to remove one item and move some other stuff around but it worked out. I also found a video on YouTube by ITS that explained a better way to fold the tourniquet. Basically the key is to fold the tourniquit so the buckle is up, not down. This makes it so you can get the tourniquit much flatter because you don't get the added thickness of the buckle. Don't get me wrong the tourniquit still fits pretty snugly but nothing like before. This is a nice looking and very well made case; however, the tolerances on this thing are FREAKING TIGHT! So much so that I question ones ability to get the tourniquet out if needed. Keeping in mind that if you need it you'r going to be stressed; maybe you'll have limited use of your arms/hands, and certainly if there's a lot of blood, things are going to become slick and hard to grasp. I get designing the case to ensure your tourniquet doesn't come bouncing out in say, a scuffle or a foot chase, but the tolerances are too tight. It took some 'creative' folding of the tourniquet just to get it in the case (tourniquet WILL NOT fit the way it comes packaged). This alternate folding then causes quite a bit of the tourniquet to stick out the top, which I don't personally care for. One last observation; this case is quite large. A lot bigger than I thought it would be. For me, this ended up being a no-go because of where I wanted to mount it on my duty belt. Actually, it was uncomfortable no matter where I tried it. On the back hip area the case pushes into my back while sitting. On the front of the belt the case grinds into my groin area when sitting. Just my opinion/observations folks, you might like this case.